The support is equally was magnificent. ThemeCatcher went above and beyond to help us integrate the plugin further into our theme. I highly recommend both this plugin and any other by ThemeCatcher! We are very critical of the plugins we use… There is nothing bad we can say, this is the most amazing forms plugin we have used and couldn’t be happier. Thank you for being amazing! If you are dissatisfied with your purchase for any reason, just contact us within 7 days of your purchase. We will honor your request, no questions asked. Note: If you are not rating this item with 5 stars, please tell us why. 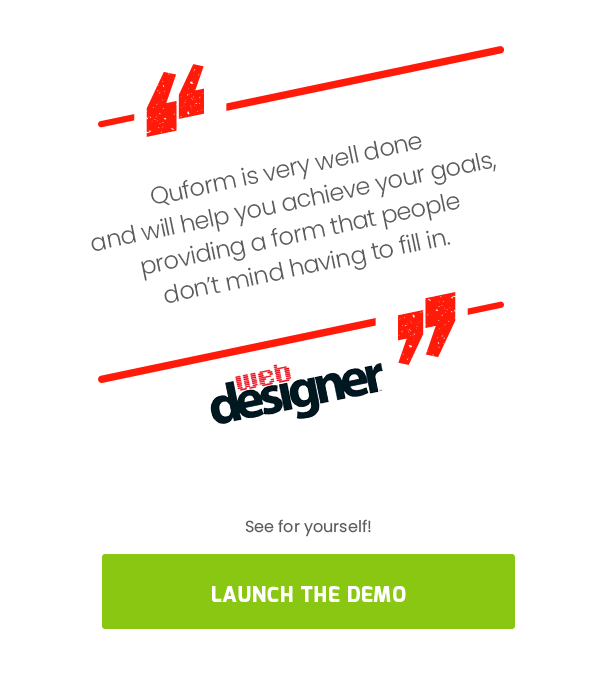 We want to do all we can to let you enjoy Quform and get the most from it. If you are having problems feel free to contact us. contact us through the contact form on our CodeCanyon profile page if you need additional help. One license can only be used on one WordPress installation at a time, but you can create unlimited forms. The license also includes free lifetime plugin updates and 6 months of support. Any buyer of the Extended License is permitted to use Quform in larger stock item that will be sold on Envato Market (for example included with a WordPress theme that is sold on ThemeForest.) See the theme integration guide for more information. We currently do not offer an “Unlimited” or “Developer” license that can be used on multiple sites. Note: the latest version is not backwards compatible with Quform 1.x, see the blog post and migration guide for more information. Why not check out the live examples?